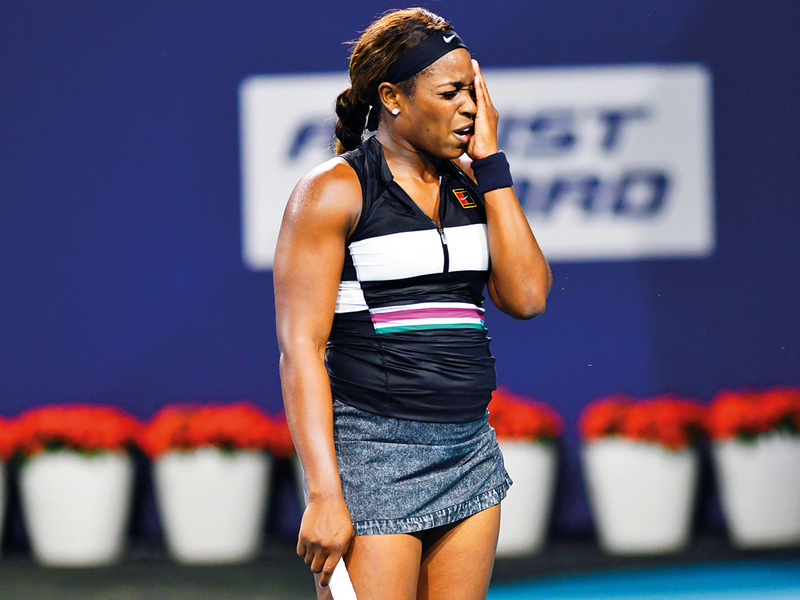 Miami: Defending champion Sloane Stephens was sent packing from the Miami Open on Sunday after a 6-3, 6-2 loss to Germany’s Tatjana Maria in the third round. Stephens, the 2017 US Open champion and world No. 6, had no answer to Florida-based Maria’s slices, chips and lobs and suffered a second consecutive early exit after losing her first match in Indian Wells to Swiss qualifier Stefanie Vogele. Second seed Simona Halep fought back from a set down to defeat Polona Hercog while Venus Williams reached the next round with a straight-sets win over Daria Kasatkina. Maria, ranked 62nd in the world, celebrated prematurely on her third match point with a lob shot that was called out, but won on the next one when Stephens sent a backhand long. “I could not be happier right now,” the 31-year-old said. “I think I played at home, because I live here. It was helping me a lot. Halep had nothing but praise for Hercog, who has a world ranking of 93rd, after dropping the first set and being pushed all the way in the second by the Slovenian. The Romanian dominated the tiebreak to turn the match around and eventually triumphed 5-7, 7-6, 6-2. Halep grabbed the match by the scruff of the neck by winning five consecutive points in the second set tiebreak and after lucky loser Hercog pulled within 3-2 in the concluding set, Halep won the next three games to seal the match. “I think in the end she got tired a little bit, then I was stepping a little bit forward to be more aggressive,” Halep said. World No. 3 Halep avoided becoming the third major player to exit the women’s draw in two days after world No. 1 Naomi Osaka was stunned by Taiwan’s Hsieh Su-wei and Serena William withdrew with a knee injury. She next faces three-time champion Venus in the fourth round after the American won 6-3, 6-1 against Russian 14th seed Kasatkina, who failed to hold serve once The seven-time Grand Slam champion broke Kasatkina eight times, losing just one game after trailing 3-2 in the opener. “I think in a lot of the matches we played before, she was just on top of her game, couldn’t miss,” the former world No. 1 said. “I think today I was just able to control the points. Got a few more errors. The Russian did not save a single break point and lost every service game. In other matches, Latvian 11th seed Anastasija Sevastova lost 1-6, 6-2, 6-3 to Kazakh Yulia Putintseva, while 25th-seeded American Danielle Collins went down 7-5, 6-1 to China’s Wang Yafan.